Several reader comments recently talk about various design changes that might be made for Union Station Loop and surrounding areas. My gut feeling from many of these is that the three-dimensional layout of existing and planned structures in this area is not well understood. To assist, to the degree I can, this post includes some drawings from the past year and a discussion of how things fit together. Some of these drawings are partly out of date and they must be read in connection with my notes here. The intention is to give an overview, not a definitive set of plans. The linked images have an aspect ratio wider than the thumbnails and more is visible in the large versions. 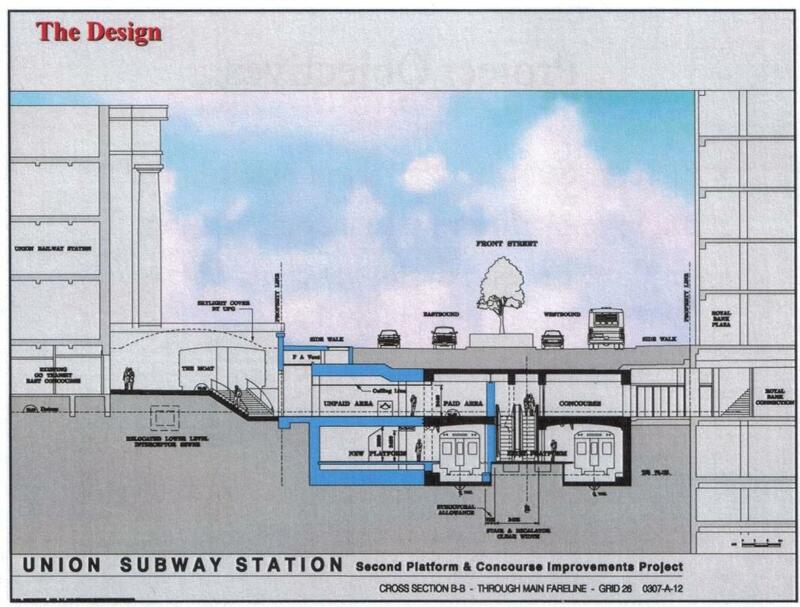 This is a cross section through the subway station looking west with the second platform (in blue) added. Although not obvious on this drawing, a new glass wall will be added between the south edge of the existing platform and the northbound-to-Yonge track. The escalator and stairway access to the northbound-to-University platform will be moved to the south edge of this platform giving more space for passengers between the University track and the vertical access paths to the mezzanine. Also visible in this drawing is a stair up to the moat level from the mezzanine level of the station. This design predates the “dig down” plans for the GO concourse. The new lower concourse will be on the same level as the subway mezzanine with a straight access through a lowered moat between the two areas. Note also that there is a sewer under the moat. This must be lowered to permit the direct access across the moat. The mezzanine of the subway station is immediately under street level. There is no room here to insert an east-west Front Street LRT station below grade. Note to the TTC: When are they going to put current information and detailed plans up on the web page which has not been updated (only reformatted) since 2006? This in an important project, but one needs a personal archive and other sites’ data to see what is going on here. This is a plan view of the platform level of the expanded subway station and the existing Harbourfront streetcar loop. There will be direct connection between the northbound to Yonge platform and the loop via the existing passageway. The space now occupied by the escalator, stair and elevator down to the passage will be absorbed into the new platform space and the mezzanine above. 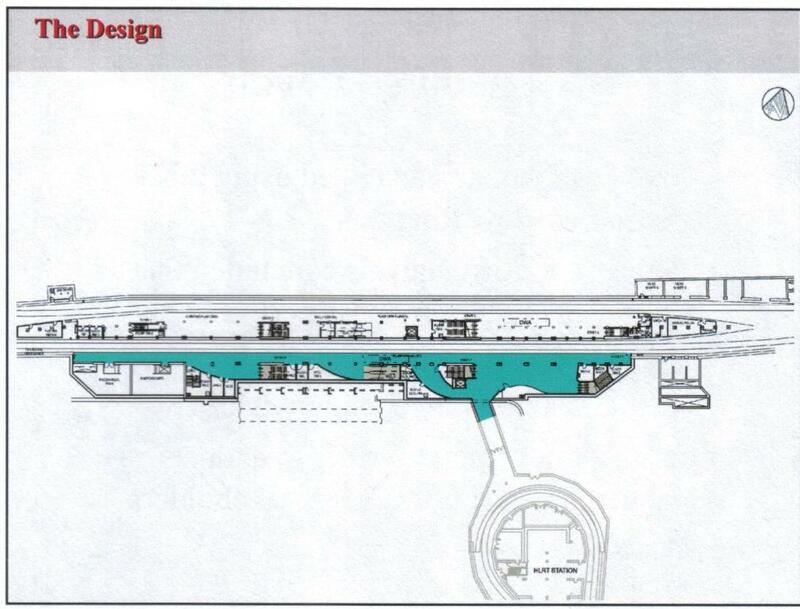 This is a plan view of the mezzanine level of the subway station. The fare control area (blue central section) is consolidated in one block, and through traffic bound for the Royal Bank Plaza is diverted around it to the west. Passengers bound to or from the subway will no longer conflict with those walking further north. 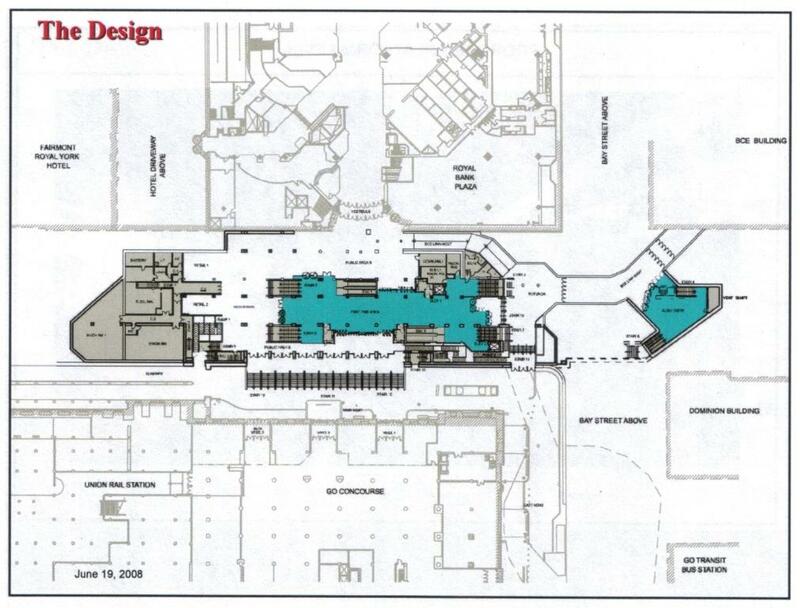 At the east end of the mezzanine, traffic coming from BCE Place can use the automatic entrance down to the Yonge platform, or continue west and south into the moat to GO, west and north to the Royal Bank, or west into the main fare control area. This plan also shows the steps up to the moat from the mezzanine. These won’t exist with the direct across-the-moat link into the lower GO concourse. Also visible in outline here is the structure of the Harbourfront Streetcar Loop. Note how it is constrained on the west by the northeast corner of the Railway Station structure. Although there does appear to be room for widening to the east, this might be relieved if the more generous opening to the GO concourse (shown in the end-stage plan for the expanded loop) is built. The loop will be one level below the lower concourse level. This is a view of the northeast corner of the station showing the stairs down from the existing moat level to the new crossing between the subway station and the lower GO concourse. The large version of the drawing includes elevations of the various elements counting up from the retail level (lower concourse), the existing moat level, the VIA concourse (at roughly the same elevation as the new upper GO concourse), the Great Hall, and finally track level. The doors shown here are at the new lower level, and the wall above (where the existing doors are) will be rebuilt to match the style of the building. This is a section through the station looking east, and the full version shows much more than the thumbnail. In this, you can see the direct link from the TTC at the new lowered moat level into the “Bay Street Promenade”, the official name for the new retail concourse. The doors shown in the middle of this promenade open out onto Bay Street. At the south (right) end of the drawing, you can see how the double-level GO concourse works, and how it takes advantage of the change in elevation of track level relative to the lower floor of the building immediately to the north. The added headroom allows the upper concourse to fit in. The PATH connection to BCE place cutting diagonally across the Bay/Front intersection at about the same level as the subway mezzanine. The tunnel from Union Railway Station to the Royal York Hotel. This tunnel is to be rebuilt without the “down and up” alignment it now has to dive around the same sewer we saw earlier below the moat. This will make the hotel connection accessible. The Northwest PATH connection project includes a presentation showing existing and projected pedestrian flows out of Union Station. The Council report for this project includes a rather busy set of drawings showing the NW PATH in detail. Still to come is the Front Street redesign EA that should begin later this spring. This will affect the area from York to Bay in front of Union Station itself. Some of the design options are linked from the Union Station District Plan page. I hope that this gives everyone a better understanding of the area around Union Station, and how some of the changes now or soon in progress will fit into an overall plan. This entry was posted in Transit, Union Station, Urban Affairs. Bookmark the permalink. Steve: When the Great Hall was built, there was still a debate about whether the trains should come in on a viaduct passing over streets as they do today, or run at grade as they did in the previous layout. The railways fought over this, but eventually the current design prevailed. One way or another, the Great Hall would not have been at track level. In keeping what Steve said, the Great Hall was pretty much finished by 1920. The decision about raising the tracks wasn’t made until about 1924 because they couldn’t figure out who would pay for it — the city, the railway companies, etc. The station itself was officially opened in 1927 because the future King Edward VIII was here on a visit. However, the tracks were not yet raised so people had to walk out the back of the new station and then across a lot of construction to get to the old Union Station’s platforms to board trains. Finally at the end of 1930 or so, the tracks serving the new station were ready and the station was truly finished. There is no possible way in today’s society that the tracks could have been at grade like they were during the time of the Second Union Station. With all the GO and VIA trains, rest assured someone would get hit by a train crossing the tracks. That’s why they are all those signs saying stay of the tracks, only cross the tracks using the stairs. Prior to 1927, just so everyone knows, the tracks WERE at grade and NOT raised. They were located near Bay street, people would have to cross the tracks in front of the trains to get across the three tracks to what was then the lakefront. Hmmm… disjointed planning. Some things never change! Steve: This is also an example of how Metrolinx, who recently discovered Union Station was a major regional hub, still don’t play a full role because there are many completely local projects regarding streetscape, development plans, pedestrian facilities and transit that are not in their terms of reference. With Metrolinx becoming an unaccountable agency, I’m quite happy to have them stay out of local work that the city does much better, thank you. Is there any way that choosing to make Waterfront LRT cars double-ended rather than sticking with single-ended would make the Union terminus more efficient, with maybe more 3-4 platforms with linear supports, perhaps staggered? Steve: In theory, yes, but the problem will remain that for a very long time we will have a mixed fleet of single and double ended cars. Given that the TTC is unlikely to buy double ended cars for the “city” network, we can only hope for a conversion some time in the future when there is a substantial fleet of “suburban” cars that can be diverted to Harbourfront operations.